Bobby Morris Morgan (born June 29, 1926) is a retired American professional baseball player. An infielder in Major League Baseball for all or parts of eight seasons (1950; 1952–58), he appeared in 671 games for the Brooklyn Dodgers, Philadelphia Phillies, St. Louis Cardinals and Chicago Cubs. He threw and batted right-handed, stood 5 feet 9 inches (1.75 m) tall and weighed 175 pounds (79 kg). Born in Oklahoma City, Oklahoma, Morgan began his pro career in 1944, playing for two minor league teams before he was drafted for World War II military duty and spent the 1945–46 seasons in the United States Army, where he served in the European Theater of Operations. In 1949, he was named Most Valuable Player and All-Star shortstop of the Triple-A International League after he won the league batting crown (.337) and collected 112 runs batted in as a member of the Montreal Royals. 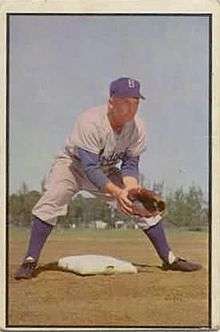 Morgan's days with the Dodgers were spent as a utility infielder, playing behind Hall of Famers Pee Wee Reese and Jackie Robinson, All-Star Gil Hodges, 1953 Rookie of the Year Jim Gilliam and slick-fielding Billy Cox. He played in two World Series for the Dodgers, appearing as a defensive replacement in 1952 and lining out as a pinch hitter in the ninth inning of Game 7 of the 1953 fall classic against Bob Kuzava of the New York Yankees. That was Morgan's only World Series plate appearance. Traded to the Phillies in March 1954, Morgan enjoyed his best big-league season that year, setting personal bests in hits (119), doubles, home runs (14), RBI (50) and batting average (.262) as the Phillies' starting shortstop, where he displaced veteran former "Whiz Kid" Granny Hamner. The following year, Morgan moved to second base, but slumped at the plate. Overall, as a big-leaguer, Morgan collected 487 hits, with 96 doubles, 11 triples and 53 home runs. He batted .233. Morgan's playing career continued in the minor leagues through 1963; he then managed for three seasons (1964–66) in the Phillie farm system and scouted for the Baltimore Orioles and Kansas City Royals. ↑ "Bobby Morgan – BR Bullpen". baseball-reference.com. sports-reference.com. Retrieved September 13, 2015. ↑ "Baseball in Wartime – Those Who Served from A to Z". baseballinwartime.com. Retrieved July 10, 2016.